In the last year 5 of our safety incidents involved shoulder dislocations. Learn how to recognize and treat the injury. As I skimmed through the latest Annual Safety Report looking for ideas for this month's article, I noticed The Mountaineers had 5 instances of dislocated shoulders in 2014. This got me thinking about all of my friends who have had shoulder dislocations while out in the backcountry. So I thought I'd change things up a little this month and take the opportunity to discuss this type of injury a little more. Hopefully, by making you more familiar with it, you might be able to handle it better in the future if you or someone with you dislocates a shoulder. Note: When help is far away, sometimes it makes sense to try to reduce a dislocation ASAP, but the most prudent thing is to wait for trained personnel. Reducing a dislocation is not a first aid skill. In most states it is not an EMT-level skill. ONLY TRAINED INDIVIDUALS SHOULD ATTEMPT THIS TECHNIQUE. Reducing a shoulder incorrectly carries a non-trivial risk of permanent harm to nerves and blood vessels. The Mountaineers are looking into the possibility of hosting such training. during a stumble while descending a rock gully. Two of the five injured had to be taken to the ER to have their shoulder reduced, two were able to pop it back into place in the field, and one report was unclear as to whether it was reduced in the field or not. As you can see, a variety of different things can cause a shoulder to be dislocated.There are three main types of dislocations - anterior (forward), posterior (backward) and inferior (downward). According to Drugs.com, anterior dislocations account for about 90 - 95% of dislocations and are usually the result of a fall on an outstretched arm (as if the injured person was trying to put a hand down and catch themselves). Posterior dislocations account for about 2% - 4%. Inferior dislocations are the most rare, at about 1 in every 200 cases, and are usually the result of a traumatic incident in which the arm is dramatically pushed downward. All-in-all, shoulder dislocations account for about 50% of all dislocations treated in hospitals. How do you know if you've dislocated your shoulder? Well, first and foremost, you will likely be in severe pain. You may also see deformity around the joint. You can compare the two shoulders to see if there is a difference. You also may have heard a snap or pop. You've dislocated your shoulder - now what? How do you get it back in (and more importantly make it stop hurting!)? There are a variety of different ways to reduce a shoulder dislocation (aka - pop it back in). One of the most common is referred to as the "baseball method". According to the Wilderness First Responder Manual from Remote Medical International, the injured person should lay down on their back. A second person should slowly bend the affected arm at the elbow so that the fingertips are pointing to the sky and the arm is at a 90-deg angle from the body. Gently but firmly pull on the bent elbow creating traction on the shoulder joint. Slowly rotate the arm at the joint as if you are trying to throw a baseball. Once the shoulder is reduced, sling and swathe the arm across the body. Another simple method is a basic hanging traction. The injured person should lay chest down on something like a log, stump, rock if you are in the backcountry. It just needs to be high enough that the person's arm can dangle freely downward. A weight (10 - 15 lbs) can be loosely tied to the wrist of the injured arm so traction is created. Once the muscles relax, the shoulder should pop back into place. Again, once it is reduced, sling and swath the arm. With both methods, gentle massage of the bicep, deltoid, and trapezius muscles will help reduce the spasming and assist in the reduction. If the injured person had dislocated the shoulder in the past, ask them what they did to reduce it the last time and if you can assist with the procedure again. In the case of any dislocation, if it cannot easily be reduced in the backcountry, do not force it. The injured should have their arm stabilized in a position of comfort, be evacuated, and seek professional medical treatment immediately. Also if this is the first time the shoulder is dislocated, it is advised that the injured seek professional attention as well - even if it was able to be reduced in the field - since damage to muscles and ligaments around the shoulder may accompany the dislocation. Unfortunately, once you have dislocated a shoulder the first time, it is even easier to dislocate that shoulder again. Please note that this article does not replace professional medical training. Do not disregard professional medical advice or delay seeking it based on the information presented here. This is for educational purposes only. 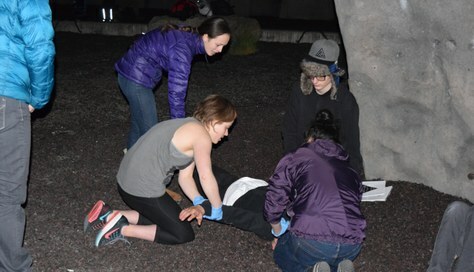 If you'd like to learn more about dealing with injuries in the backcountry, talk to your local branch chair about taking a Mountain-Oriented First Aid (MOFA) Course, a Wilderness First Aid (WFA) Course, or a Wilderness First Responder (WFR) Course. Good points! Thank you for the article. My anterior shoulder dislocation resulted from a slip on an icy path. As we were 30 min. from ski area physician we did not attempt to reduce it. MD tried several methods over course of an hour before successful reduction. Both bones were damaged. No surgery, PT over 5 months to return range of motion. In my case I suspect the Basic Hanging Traction (BHT) would have worked best. Given the general lack of natural features with "dangling height" I have wondered if combining trekking poles, rope or cord, carabiners or pulley might allow this technique to be applied with victim sitting, or on their back, with perpendicular force (hanging weight) applied via change in direction. A further variation might be to hold or secure the wrist to something and lean back enough to supply a modest fatiguing force to shoulder muscles.